To the right of the main falls, high up on the same cliff band that forms this one, is another little waterfall which will only be present in very high water flow. It is just visible from the base of the main waterfall. At this falls, you're actually not far below the Blue Ridge Parkway, below Wolfden Knob on the steep ridge connecting Rocky Knob and Lane Pinnacle in the southern Craggy Mountains. Since it's this high up on the mountain, this waterfall will need lots of rain to look its best, but after wet weather it is pretty neat. It may slow to a trickle or just a wet stain on the rock during dry weather. From Asheville, NC, go east on I-240 to Exit 7, Tunnel Road. Go east on Tunnel Road/US 70 and go 2.0 miles. Turn left onto Riceville Road - it's at the light at the McDonald's/Ingles shopping center. Go 3.7 miles on Riceville Road. Just past the Riceville Fire Department & Community Center, turn left onto Bull Creek Road, then almost immediately fork right up onto Shope Creek Road. Go 2.3 miles to the end of Shope Creek Road, where the road dips across the creek on a low-water bridge. It's another 0.1 mi. straight ahead on the gravel road to the parking area, on the left. Note: None of the trails in Shope Creek are marked, so locating the falls can be a bit challenging if you're not used to backcountry travel. Keep that in mind here. Start the hike by going around the gate and up FS 220 through the stand of white pines. The gravel road ascends gently to a fork just past a huge oak tree on the left. Take the left fork, onto FS 220A, the "Shope Creek" trail. This logging road gets a bit more inclined, but is by no means "steep". You'll reach a recently logged area on the left; look for a well-used trail leading to the right past a cutoff log and dirt mound. It's unmarked, but it's the first significant trail leading right into the woods toward the stream. Follow this old road (the "Forrest Falls" trail) down a short distance to a crossing of a tributary to Shope Creek. It then starts back uphill - it gets moderately steep and rocky for a short distance here. Nothing too difficult. As it climbs out of the stream gully, another trail splits to the right. Keep left, uphill. After a short distance, "Forrest Falls" trail angles to the right onto yet another old logging road. Forrest Falls itself is just ahead of that. But before it, there is a junction with a trail leading to the left in an area of ground cedar; that's the one you want. It goes down a bank, curves right, and continues uphill on an old logging road ("Wolfden Flats" trail). Before long "Wolfden Flats" trail devolves into a kind of dual trail-streambed situation, with the trail on the right and the rocky, wet-weather stream or seep on the left. It then curves to the right to cross a small tributary of Shope Creek. That's the tributary Wolfden Falls is on. (If this tributary is dry or barely running, you might as well turn around because it's only going to have less water on it even farther uphill. You want it to at least resemble a small, lively, hop-across brook for the best results). Now, just before the tributary crossing, on the left, is another old logging road heading more steeply uphill; take that and follow it uphill about 1/4 mile to where it ends just below the falls. If the leaves are down and the water is up, you can just barely spot the falls through the trees at the end of the logging road. 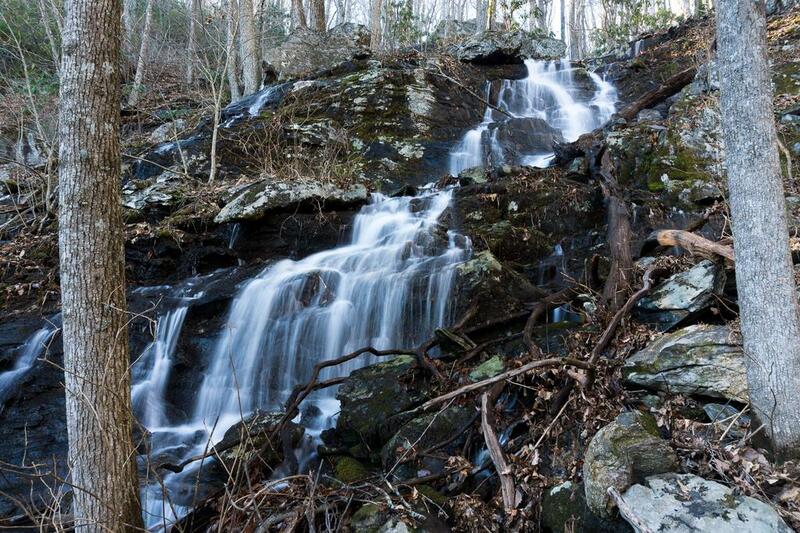 Continue working your way up the creek through the open woods to the falls. You'll probably want to cross to the other side just before reaching the falls for the easiest route. Careful; it's somewhat rocky and slick, and the valley is full of stinging nettle during the warmer months.